It's a great time of year for a cute family picture. Unless you are a Lotz. I LOVE getting all of the cute Christmas photos in the mail and seeing them all over Facebook. So adorable, with perfect smiling children, matching clothes, and cute couples. But we don't play that way. Don't get me wrong...I would LOVE to get a cute family photo or two so we can document our family as it is right now (as we WAIT to bring a daughter home while enjoying the two sons we already have). However, we don't do well in pictures. Take this past Sunday...my whole family gathered for an old-time photo with my grandparents. A fun, cute idea, right? We enjoyed dressing up and the boys REALLY enjoying being cowboys and wielding fake guns. But when it came time to take the picture...pure craziness. With 18-ish people in the photo, it was going to be difficult to get a great pic of everyone. Throw in my two little napless crazies and you have yourself a mission impossible. Brecken refused to sit where he was told. He refused to sit anywhere, actually. Brody was so enamored with his fake pistols he kept putting them in front of his cute little face to look closely and show them off. Then Brecken would put the end of the gun in his mouth...a great display of how I sometimes feel about trying to get a great family picture with two little yahoos (whom I love dearly, but whose faces I wish I could capture in all of their cuteness). The photographer might have been sweating by the end of our session, and she may never forget the names Brody an Brecken, as she had to yell them every 3 seconds to get the boys' attention. The proofs came back and in the 3,000 or so pics she took about 7 of them contained only mildly awkward faces or poses from my boys. (Unfortunately, those were the pics where I looked like was I chewing cud or something. Oh well, I took one for the team.) I guess, thinking positively, their crazy poses helped with the picture choosing process, if nothing else. And then there was last Thursday's picture attempts. The boys were all dressed up in sweaters, ties and even a suit jacket. Brad sported a tie for the THIRD time this year, which is more times than he has worn a tie in his whole life prior to 2014. I thought it was the perfect time for a quick picture before we headed to The Vine's (college ministry's) winter dance. We sent the kids to stand by the tree to pretend they were looking at something cool. (They have to pretend because our tree isn't that cool, as most ornaments have already been broken.) They didn't play our little pretend game, so I asked them to go look at the train ornament, which is also broken but the train still circles around the base of the ornament. That lasted about two seconds, not enough to get a great picture, because it takes me 267 tries to get a picture right. I needed something to keep them busy longer. "Brody, will you get that ornament off the tree for me?" At that moment, I crossed a line. If I have said it once, I have said it one thousand times, "Don't touch the tree ornaments." And now, for the sake of cute Christmas picture perfection, I took 3,000 steps back and opened the door to all sorts of Christmas ornament-breaking mayhem. 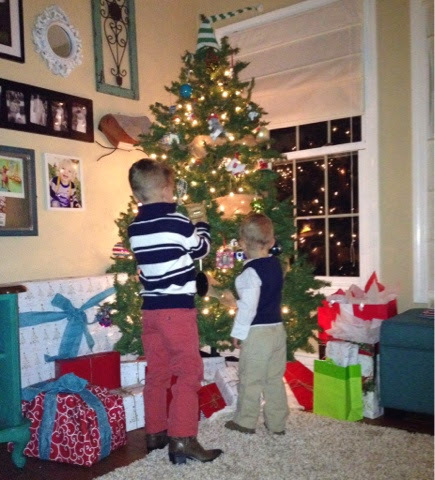 He grabbed the ornament, and for a few moments it looked like the boys were sharing ornaments and hanging them together. I snapped pictures while lying on the ground, running around the side of the tree, standing on chairs...anything to get a good angle. That pic above is as good as it got. I finally gave up on the cute picture idea and settled with a few awkward pics of the boys rolling their eyes and making awkward faces at the camera. If you get a Christmas card from us, be prepared. It won't be your ordinary, cute kid Christmas picture. It will, however, be a very "real" picture, so at least I can appreciate that fact. 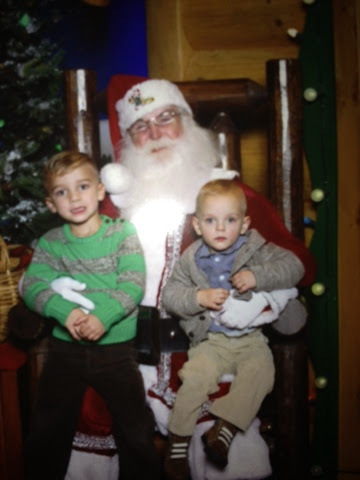 And to top off my point, for kicks, here is this year's Santa pic, which looks identical to last year's pic, except for the boys' larger sizes. That would be Brody fake-smiling and Brecken stonewalling, which is what they both do best in pictures. Cheers and joy to you all, just don't expect to see it in our faces.